Dr. Cruz-Torres is board certified in obstetrics and gynecology, as well as a fellow of the American College of Obstetrics and Gynecology. After completing his residency, during which he earned Chief Resident status, in obstetrics and gynecology at University Hospital in San Juan, Dr. Cruz-Torres served as an OB/GYN major, as well as held an OB/GYN military position in the US Army. He is extensively trained and expertly skilled in minimally-invasive surgery, including vaginal surgery and vaginal repairs. 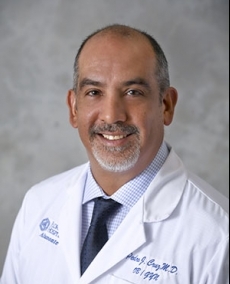 Additionally, Dr. Cruz-Torres is a da Vinci® Surgical System certified surgeon. His expert OB/GYN skill is perfectly complemented by numerous staff physician, professional, teaching and committee positions held—each furthering the field of obstetrics and gynecology, while delivering excellent patient care.